If all the talk about fancy new homes hitting the market has you revved up, you may consider looking at a former garage or parking lot — because it’s the latest location where luxury developers are now building. 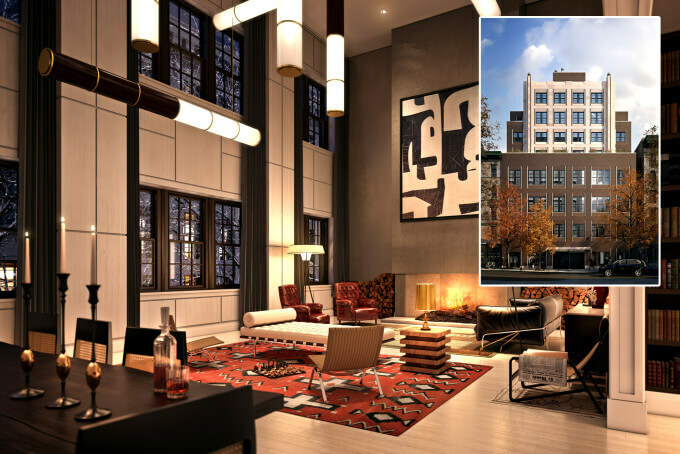 Consider 12 E. 13th St., the conversion of a Hertz rental-car garage into a 12-story, eight-unit development, where the entry price is $7.5 million for a three-bedroom (and goes up to a gobsmacking $28.5 million for the triplex penthouse). 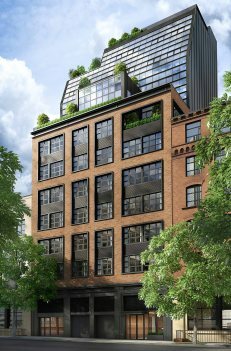 The new development at 12 E. 13th St., a former Hertz rental garage, will have eight units starting at $7.5 million and going up to $28.5 million for a penthouse. The former Hertz rental site at 12 E. 13th Street, now spruced up. With land scarce in this city, the garage-to-condo concept actually makes a lot of sense when developers think about nabbing a plot of land. DHA decided not to raze the existing structure but turn its massive amount of empty space into apartments. And it means the units at 12 E. 13th St. (which is being designed by Cetra/Ruddy) are massive: There is one half-floor unit, but the rest are all full-floors (measuring 4,800 square feet each), along with two duplexes and one triplex. And though the rental cars may be long gone, the building will not be entirely auto-free. “Each unit gets its own private parking space,” says Josh Schuster, principal at DHA. “And they’re state-of-the-art parking units.” Meaning: A robotic system stores the cars on the second floor, and a vehicle can be retrieved in 90 seconds with a command from the owner’s phone. Sales start tomorrow on the condo project; it is due to be completed in the first quarter of 2015. And 12 E. 13th St. isn’t the only luxe property being built where autos were once stowed: 224 Mulberry St., which came on the market earlier this month, with units ranging from $6.25 million to $30 million, is on the site of a one-time parking garage. 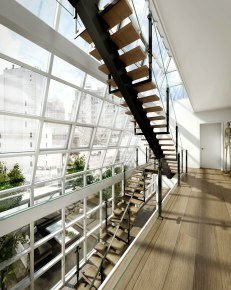 The spectacular view from inside the three-story penthouse at 12 East 13th Street. Flank Architecture is the developer of the 110-foot-tall, seven-unit, ground-up project. The 40,000-square-foot building should be finished in 2015 and will feature a common roof deck, gym, storage space and parking. (We’d expect no less.) And one shouldn’t leave Brooklyn out of the mix. One of the most anticipated projects is the nine townhouses (called, appropriately enough 9 Townhouses) that Hamlin Ventures and Time Equities are putting up on State Street in Boerum Hill, where a parking lot once stood. Many years in the making, the homes should be completed this year; seven of the nine townhouses are currently in contract and the first closing was this week. 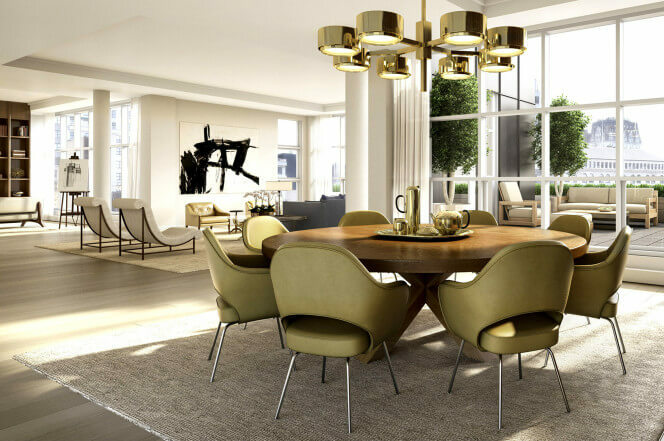 The lot might have been an eyesore for a neighborhood crammed with 19th-century brownstones, but it at least provided a blank canvas for a developer with imagination. The two remaining homes are listed for $3.65 million and $4.3 million, with the smaller of the two clocking in at four bedrooms and 4,340 square feet. The more expensive unit has four-bedrooms and 4,800 square feet of space. Naturally, the bigger house comes with its own parking spot. The seven-unit, 12-story condo at 224 Mulberry St. (inset) where a garage once stood, will house units priced from $6.25 million to $30 million.